Peter Jackson and his producing partners have announced that their two-film adaptation of The Hobbit will be stretched to three films. Jackson had filmed a lot of material for the two movies which will have to be cut out due to time. After discussions with the studio, this material will be combined with new material (filmed early next year) to turn The Hobbit into a trilogy. "Guys, it's the script for The Hobbit III: Fifty Shades of Gandalf the Grey. You do not want to know what Galadriel is doing with that elven rope in this scene." 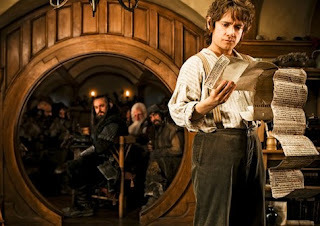 At the moment it is believed that the first two movies will retain their titles of The Hobbit: An Unexpected Journey and The Hobbit: There and Back Again, and their planned release dates of December 2012 and 2013. The planned third movie will presumably be released in December 2014. No suggested subtitles for it have appeared (expect fan suggestions such as 'The Search for Plot' and 'There and Back Again and Back Again as Long as They Keep Paying' imminently), but given Jackson's preferences for keeping Tolkien's names, a chapter title from The Hobbit or The Lord of the Rings could be pressed into service. Presumably it won't be The Hobbit: Queer Lodgings though. My preference would be The Shadow of the Past (a chapter title from The Lord of the Rings, used by Christopher Tolkien to title one of his History of Middle-earth books). At the moment it is not entirely clear how this division would work. Originally Jackson envisaged one movie focusing on The Hobbit in its entirety and a second serving as a 'bridge film' to The Fellowship of the Ring. Later on, the two were combined with much of the bridging material now taking place simultaneously with the action of The Hobbit and the combined action broken across two films. Given the slightness of The Hobbit's plot, as depicted in the book, it would seem improbable that they could extend it across three movies, even if those movies are a lot shorter than the Lord of the Rings trilogy. If the plan is to retain two movies covering The Hobbit with the third film taking place afterwards, this could work better (and would allow sceptics to skip the third film if they really wanted to). It's worth noting that Peter Jackson only has the rights to The Hobbit and The Lord of the Rings (and its numerous appendices). A great deal of background information fleshing out both The Hobbit and the period between it and The Lord of the Rings appears in the book Unfinished Tales and could be used to build a more comprehensive storyline, but Jackson does not have the rights to this book (or The Silmarillion or any of other post-LotR Middle-earth volume) and Christopher Tolkien has made it clear he will not sell the rights to them at any price. This would seem to somewhat limit the material that Jackson can draw upon for a potential third movie. 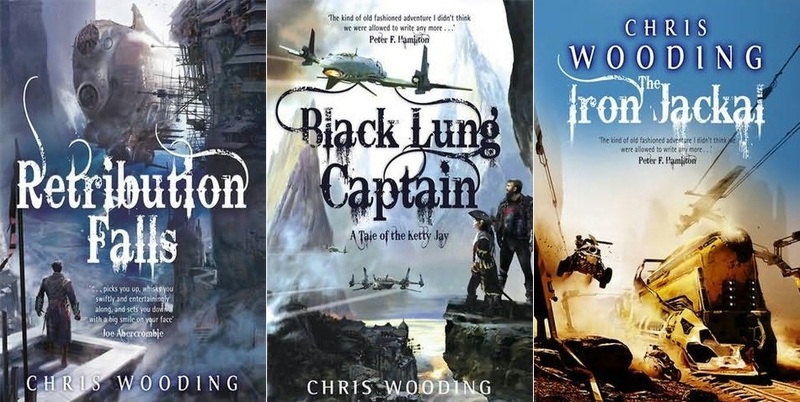 Chris Wooding has announced that the forthcoming fourth novel in the Tales of the Ketty Jay steampunk airship series, The Ace of Skulls, will be the final book in the series. 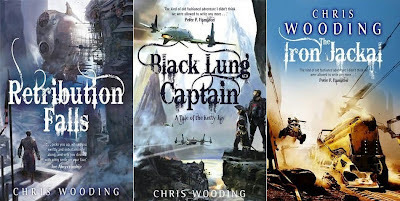 Originally Chris had planned to write a series of self-contained adventures with a few continuing elements, but during the fourth book discovered that the number of continuing storylines he'd built up had become larger than he'd planned. He's chosen to end the story definitively rather than risk it sprawling out of control across numerous volumes. No word on what his next project will be post-Ketty Jay, but Wooding is also working on a 'remastered' ebook version of his earlier Broken Sky series of anime-influenced short novels. Wooding will be self-publishing these books himself in Kindle and ePub formats, with a date still to be decided. Good news on the Broken Sky situation, but the conclusion of the Ketty Jay sequence will be a sad day. Still, better for the author to finish it on his own terms rather than drag it out for years for financial gain. The first season of Star Trek: The Next Generation launched on Blu-Ray last week as part of the 25th anniversary of the show. Much has been made of the updating of the series to high definition, with the Blu-Ray set dedicating an entire documentary to the process, which is fascinating. An original shot from The Arsenal of Freedom, upscaled to HD from the original 1988 videotape master. 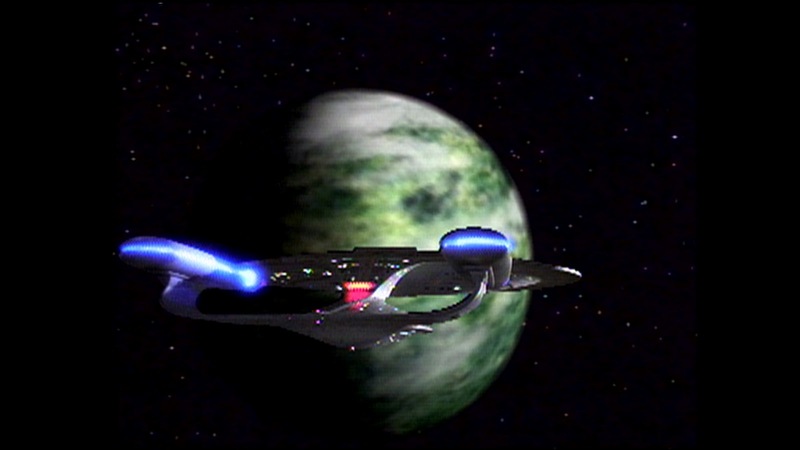 The planet is blurry because the original was a matte painting transferred into a low-res bitmap, whilst the Enterprise lacks detail due to coming off the SD video master tape. The jagged lines are down to less-effective mixing technology. The same shot from the new Blu-Ray version. The original, low-res planet bitmap has been replaced by a 3D CG model, based on the original but far more detailed. The Enterprise is actually the exact same shot as in the original episode, with the extra detail emerging from the original film footage rather than any modern enhancements. The original series of TNG was shot on 25,000 reels of 35mm film, the standard for television and film production. In retrospect, this was a thankful decision, since 35mm film can be blown up and projected onto massive cinema screens and therefore needs to contain vast amounts of information, far more than can be displayed on high definition TV screens. This means that any TV series or film shot on 35mm can be ultimately 'saved' and transferred to HD, with varying degrees of work done. Conversely, any show filmed directly on video (such as most of the original Doctor Who), cannot be transferred to HD (or rather it could, but would look awful). However, whilst the show was shot on film, it was edited and mastered on video. The film reels (of both live-action footage with actors and elaborate model shots of the Enterprise and other spacecraft) were run through a video editing suite, with music, sound effects, credits and visual effects (such as phaser blasts and transporter effects) added. The resulting master tape contained the 'finished' episode...but only on video. These video masters are the source of the original television transmissions and the later VHS and DVD releases. Whilst good for their day, the master tapes were not in high definition and were mastered for the then-standard square-shaped, 525-line NTSC American standard. This had two drawbacks. Firstly, it meant that the directors of TNG - and other US TV shows of the time - were frequently only concerned with the 'middle' of whatever image they were shooting, and left boom mikes and other equipment in the left and right edges of the shot, knowing they would not be seen. Whilst fine for that time, it does mean that most TV shows of that era cannot be displayed in the now-standard widescreen aspect ratios, as it would contain things we were never meant to see (such as light stands or actors waiting to enter the scene). Secondly, and more irritatingly, the image can appear to be soft, slightly unfocused and even blurred when viewed on other standards, such as the PAL system used in the UK and numerous other countries. 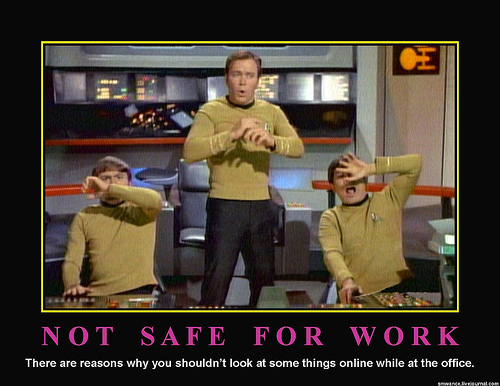 Wesley Crusher saves the day for the first of way, way too many times. To overcome these issues, CBS initially decided to upscale the existing master tape images. A more thorough and complex version of the system used by Blu-Ray players to upscale standard-definition DVD images, this produced some good results but was inconsistent and distractingly variable in quality (the Blu-Ray documentary shows some comparisons of this process to show how it panned out). CBS ultimately decided this was unsatisfactory and they would have to start over by returning to the original film elements and re-editing the entire series from scratch. This sounds simple but in truth is a daunting task. A typical 44-minute episode of Star Trek spent as long in editing and mastering (basically, the entire post-production process) as it did in shooting in the first place. A substantial portion of each episode's budget and time went on this, and CBS were now ordering it to be done again for every single episode of the series. This required a staff of dozens working as hard - and in some cases harder - as the original series editors to reassemble each episode. Fortunately, Star Trek: The Next Generation was filmed before the advent of widespread use of CGI, meaning that most of the space scenes featured miniatures filmed on 35mm which could be easily re-used. CGI in the 1980s and 1990s never passed through the filming process and was output directly onto video, meaning that in order to be upgraded to HD for Blu-Ray, CGI from that era needs to be completely junked and re-rendered from scratch at a higher resolution, which is astronomically expensive. This makes a Blu-Ray release of, say, Babylon 5 virtually impossible (although B5's situation is complicated by the loss of some of the original film stock) and even makes Deep Space Nine and Voyager dubious, unless TNG's re-release is hugely successful. Fortunately, TNG used pure-CGI scenes only a couple of times during its run (in the first season, most notably for the Crystalline Entity in Datalore) and these can easily be re-shot. As the documentary on the Blu-Ray states, the re-mastering process is essentially straightforward in theory, since all of the artistic decisions (composition of shots, which takes to use etc) were made back in 1987-88 and thoroughly catalogued and noted. For the most part, the new editors simply had to rescan the film negatives for each take and re-compile them according to the notes (or simply comparing them to the existing DVD/VHS versions). However, they almost immediately ran into problems of missing effects footage. Because video images degrade each time they are copied, every time the original editors decided to re-use an existing flyby shot of the Enterprise, they returned to using the original film footage. This meant that, in storage, the film footage moved from episode to episode as each shot was re-used. 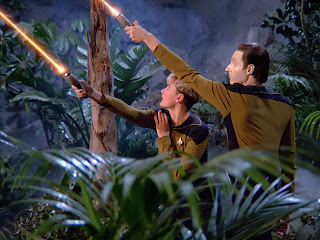 In some cases, they found shots of the Enterprise belonging to the pilot episode, Encounter at Farpoint, in the same storage boxes as episodes from the third and fourth seasons. More inexplicably, entire scenes would sometimes be misplaced. A 12-second sequence from Sins of the Father in the third season wound up in a totally different episode box. In some cases the new editors spent weeks tracking down a single shot of just a few seconds to reunite it with its original episode. This hard work paid off: out of the 1,150 minutes of the first season, only 2 seconds of footage from We'll Always Have Paris could not be found, and the original SD video had to be used and upscaled. If you can spot it, I'll be impressed. We come in peace, shoot to kill! Another problem also reared its head immediately, although this was anticipated: as effects were added on video, the new editors had to redo every single beaming effect, every single phaser blast and every single visual effect of any kind, both in the live-action footage and in the space scenes. Every single scene involving bluescreens also had to be re-composited. What was not anticipated was that the a lot of the original matte paintings, particularly of the planets that the Enterprise orbits, had gone missing in the intervening time and the surviving low-res bitmaps were not of any use. So almost every single planet in the series (barring the one in 11001001, which is a high-res matte painting of Earth taken from The Search for Spock) has been replaced by a highly-detailed 3D model, based on the corresponding matte painting but with far more detail and, noticeably, animation (i.e. the planets spin as the Enterprise orbits them). This also allowed the effects team to fix a few instances of blatantly the same planet being re-used by altering terrain details and a few colours. A happy by-product of this approach is the total elimination of matte lines. In the original video master, lines around and mild discolouration of the spaceship models can sometimes be seen, a result of the inferior editing technology of the time. By re-compositing scenes with state-of-the-art equipment, the effects sequences are now flawlessly displayed. This is most notable in the opening of the pilot, with a beauty shot that starts low and then moves up to the underside of the Enterprise, over the front of the ship and into the bridge. 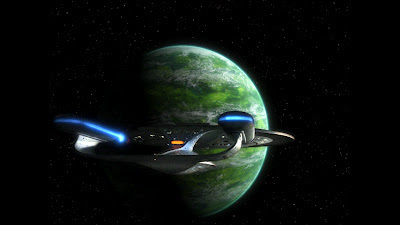 The original version, with the contrast turned up, displays clear matte lines around the Enterprise which are now completely absent. The HD presentation also radically improves the image quality of the models themselves, resulting overall in impressive effects sequences that would look excellent in a modern movie. The same applies to effects sequences involving actors. Phaser blasts are more vivid, composited scenes dispense with the more obvious 'bluescreen-ness' elements (fuzzy lines around actors being vapourised or whatever) and people beaming in and out of scenes are no longer accompanied by subtle shifts in lighting or colour (or at least not as noticeably as before). One drawback of HD is that in a few cases the use of blatant stunt doubles is more noticeable than before. Overall, the Next Generation remastering project - the largest remastering project of its kind ever attempted - is a stunning piece of work. It takes an old show from the 1980s and makes it look like it was filmed yesterday. If successful, this remastering technique could be used to 'save' many shows from the 1970s onwards that would otherwise be forever condemned to inferior SD upscaling. Certainly the new Blu-Rays need to be a success for this to happen and other shows to follow. Season 1 of ST:TNG is out on Blu-Ray now. Season 2 will follow in a few months. CBS hope to release all seven seasons by 2015, with a possible update of Deep Space Nine to follow if the re-release of TNG is successful. My own review of TNG Season 1 will follow in a few weeks. Fuller coverage of the Blu-Ray remastering, including interviews with the people working on it and numerous comparison screenshots, can be found on the TrekCore site. Beamdog have announced that Baldur's Gate: Enhanced Edition will be released on PC, iPad and Mac on 18 September this year, with an Android version to follow a few weeks or months later. They have also given more details about what the remake will consist of. 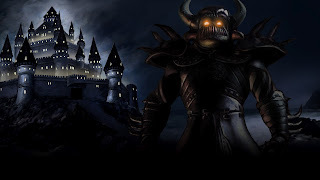 As well as being made compatible with modern operating systems and graphics resolutions, the game's user interface has been updated, with many of the improvements from Baldur's Gate II ported back to the original game. The cut scenes have been re-rendered and new cut scenes added. There are three new recruitable characters: a Calishite monk, a half-elf wild mage and an half-orc blackguard. There's also a whole new quest, in which you create six new characters and take on a formidable challenge extending across multiple levels of a dungeon. The game features the original music and voices, but also some new music and voice work. The game's expansion, Tales of the Sword Coast, has also been integrated into the original game as well. Of course, the 'improvements' from the new edition can be, if you wish, safely ignored if you just wish to enjoy the original adventure as BioWare intended back in 1998. Assuming this is successful, an enhanced edition of Baldur's Gate II: Shadows of Amn (incorporating its own expansion, Throne of Bhaal) will follow next year. A fresh attempt to reboot the classic British space opera series Blake's 7 has been announced. The original cast of Blake's 7 (the seventh character was an advanced AI and is not shown). Martin Campbell, most famous for directing the James Bond movies GoldenEye and Casino Royale (and thus introducing two new Bonds to the franchise), has signed on to direct a pilot episode. Joe Pokaski, a writer on CSI and Heroes, is penning the script. Georgeville Television (a newly-formed production company) will handle the production of the pilot, which will then be shopped around to American networks and stations. Blake's 7 ran for four seasons and 52 episodes from 1978 to 1981 and chronicled the attempts of a crew of desperadoes, political dissidents and idealists to bring down the dictatorial Terran Federation. The show was notable for an evolving storyline where things would change and stay changed (in stark contrast to most episodic television of the time) and its willingness to kill off characters at the drop of a hat. 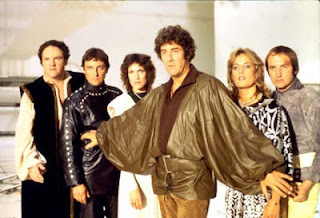 The series was also notable for its deconstruction of the heroic myth, with the writers constantly subverting and challenging lead character Blake's motives in trying to destroy the Federation. It was adult, thoughtful science fiction which unfortunately was made on a budget so minuscule it was barely detectable. Costumes and sets were poor and the quality of the guest actors highly variable, though the regulars, particularly Paul Darrow as the calculating, cynical and pragmatic Avon, were pretty good. 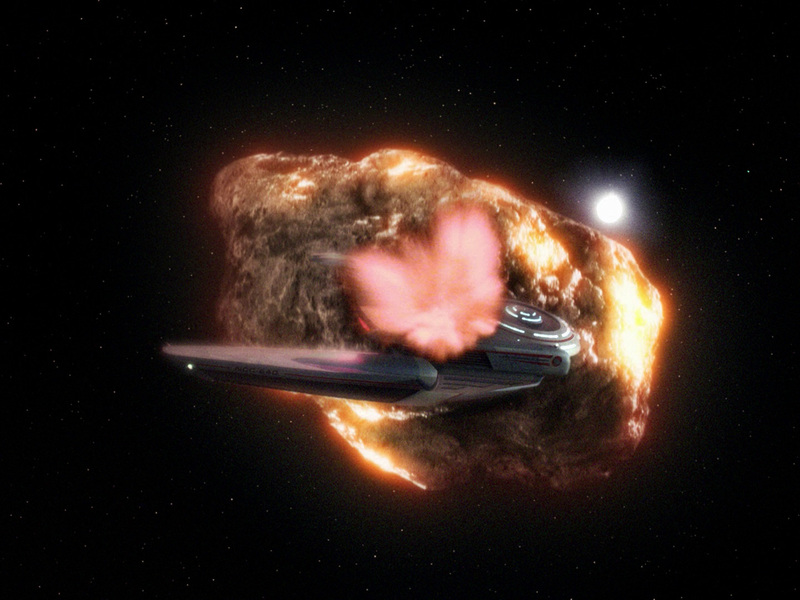 The show is also notable for its bleak ending, where the entire crew is wiped out in an ambush, their spacecraft is destroyed and the Federation left victorious. Actually, this was only meant to be an end-of-season cliffhanger leading into a fifth year, but the BBC decided to cancel the show on an inexplicable whim despite it gaining impressive ratings in its final few episodes. There have been several previous attempts to reboot the series or make a Next Generation-style sequel, some of them sponsored by the previous creative forces and actors, particularly Darrow. The previous attempt was scuppered in 2008 when the British Sky network and ITV considered collaborating on a new series. ITV pulled out and Sky continued the project alone before dropping it a few months later. The news of the show's possible revival is welcome. Blake's 7 was a direct inspiration on Babylon 5 (Joe Straczynski has always cited it as a huge influence) and a probable one on Firefly (Joss Whedon has said he watched the show whilst attending a British school). With its cynicism, political awareness and hard-headedness, it was the new Battlestar Galactica, but airing at the same time as the original BSG. To say it was ahead of its time is an understatement, with many of its innovations (serialised storytelling and season-ending cliffhangers) not becoming regular occurrences in SFTV for more another decade. Hopefully the reboot/reimagining will capture some of the same aspects that made the original show great. If it's treated as just another generic space opera it will fail. No word yet on if any of the original actors or creative forces will be involved. I gather this is more of a 'featured extra' thing than any more substantial role. It seems to be in thanks for Lightbody and his bandmates being huge fans of the show and frequently mentioning it on their webpages. During the filming of the previous two seasons, the band (half of whom are from Northern Ireland and sometimes use Belfast as a base of operations) hung out with castmembers and crew on several occasions. Lightbody with producers D.B. 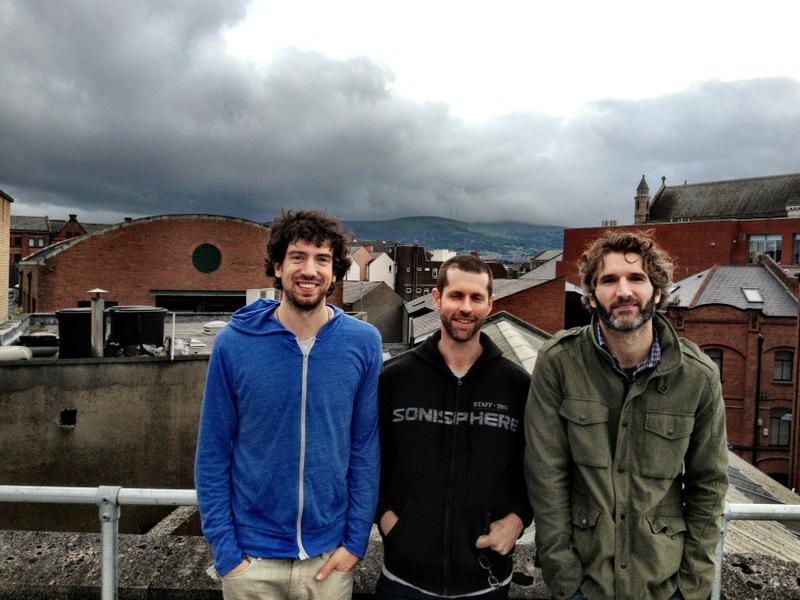 Weiss and David Benioff in Belfast. Interesting news. Thrones still has a very low profile in the UK, due to its transmission on a satellite channel with a tiny audience (although Thrones is by far the most popular show to ever air on it, it's still very obscure here). This has changed a little bit as more magazines pick up on it and as the DVDs and Blu-Rays continue to sell excellently. BBC Radio 1 also has featured the show several times recently as a recommended show, and in fact one DJ got into a mock-Twitter feud with Lightbody when the latter accidentally spoiled a plot twist for him. If this kind of stunt-casting can help raise the profile of the show a little over here, I'm all for it (even if at one stage I feared madness induced by hearing 'Chasing Cars' six thousand times a day, every day on the radio). 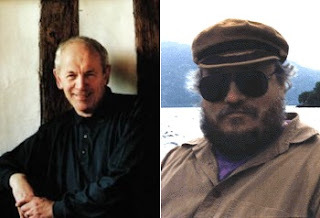 Fantasy authors Alan Garner and George R.R. 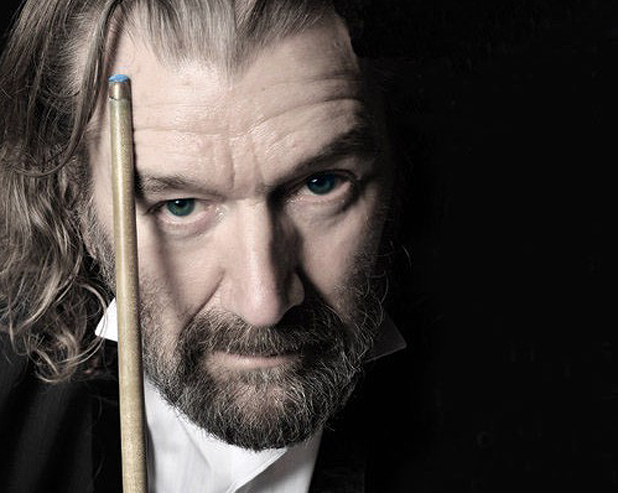 Martin are to receive Lifetime Achievement Awards at the World Fantasy Convention in Toronto later this year. Garner is an English novelist noted for his use of folk tales. He is best-known for his children's fantasy novel Elidor (made into a TV series in the 1990s) and his Brisingamen trilogy, consisting of The Weirdstone of Brisingamen (1960), The Moon of Gomrath (1963) and the long-gestating Boneland (2012). Martin, I'm sure, needs no introduction. The fact that Garner is his co-recipient will I'm sure please GRRM, as he is a fan of Garner's work and in fact has a House Garner (complete with a sigil based on his novel The Owl Service) listed amongst the noble houses of Westeros. The convention will take place on 1-4 November this year. 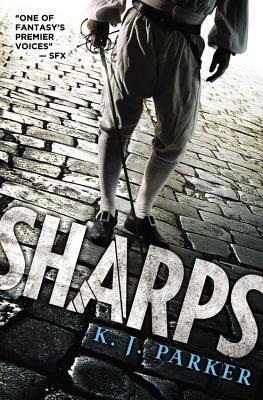 Sharps is the latest stand-alone novel from the enigmatic K.J. Parker. Parker is known for her fascination with medieval and renaissance weapons of war and basing entire narratives around them. Usually these narratives work on multiple levels, with both extensive literal use of the item in question and also its use as a metaphor. In Sharps Parker returns to her love of the sword and the sport of fencing, which she last studied in detail in her very first novel, the excellent Colours in the Steel, fifteen years ago. Sharps is a very different book, however, to both that novel and her normal output. Most of Parker's books focus on a single character in detail, whilst Sharps has an ensemble cast. The four fencers are the main focus, along with their manager/trainer and their redoubtable political liaison officer. Parker also visits a whole bunch of bit-players on both sides of the border as different factions try to make use of the situation for their own ends. The result is a busier feel than most of her novels, which tend to be more intensely focused (sometimes to the point of claustrophobia). This works well, with each character set up and well-motivated in a concise fashion and then developed through the novel through their interactions with one another. Each character - the deadly war veteran Suidas, the manager Phrantzes, the foppish Giraut, the level-headed Addo (the son of the Irrigator) and noble Iseutz (the only female member of the team) - has his or her secrets, demons from the past or hidden motives, and Parker flips between them with verve and ease. Her trademark dry, black humour is also very much in evidence. Sharps is an offbeat epic fantasy novel. Blood is spilled, thousands are killed and the fates of entire nations hang in the balance. Yet we see very little of it. The bulk of the book is set in the fencers' carriage (or one of them, as the have to change wagons several times due to various acts of mayhem) as they talk to one another, discuss the political situation, play chess and argue over various matters. Intermittently the novel feels like Waiting for Godot as rewritten by George R.R. Martin, with a dialogue polish by Terry Pratchett. The situation outside the carriage changes rapidly, with riots taking place and civil war threatening, but the four fencers only hear about it second-hand through confused reports, some of which may be misinformation fed to them deliberately. 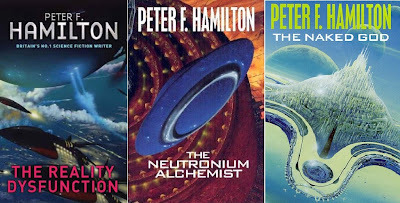 Neither the characters or we really know what's going on, and both will be baffled for much of the novel's length as increasingly random events take place, only being explained in the revelatory conclusion (after which a re-read of the novel with foreknowledge of the end could be an enlightening move). Sharps (****½) is one of Parker's strongest novels to date. The characters are among her most memorable and fully-fleshed out, the structure is unusual but well-handled and allows for the politics, intrigue and backstabbing to be undertaken in a manner that does not descend into cliche. There's also a mordant wit which is deeply satisfying (especially when Parker directs it against some of the corniness of the fantasy genre). Parker even gives the book an ending which makes everything feel worthwhile, rather than pointless (a traditional weakness of some of her earlier books). The only problem is that the opening sections can feel very stilted until you get used to Parker's approach to this storyline. The novel is available now in the UK and USA. Red Dwarf was a hugely successful SF sitcom, airing on the BBC in six seasons from 1988 to 1993 and returning for two more seasons in 1997 and 1999. After a lengthy period trying to get a feature film version commissioned, co-creator Doug Naylor wrote a three-episode mini-series (which has now effectively been retconned as the ninth season) in 2009 for the British cable channel Dave. Although critically panned, the mini-series got very high ratings, smashing all previous records for the channel. Dave subsequently commissioned a six-episode full season, shot in December-January 2011-12 and due for airing in the autumn. Will it be any good? The omens are not great. Red Dwarf was dealt a serious blow when co-creator and co-writer Rob Grant left the series following the filming of the sixth season. It never really recovered from it. The seventh and eighth season had a few decent moments, but overall were pale shadows of their former selves (despite relatively big budgets and use of CGI, which some fans suggested may have contributed to the problems). The Back to Earth mini-series was even worse still. However, for this new season there are some signs of hope. Limited funds mean that they have to make more use of the classic format of the four guys hanging out on the ship and getting into weird scrapes. They are also acknowledging the ageing of the characters rather than ignoring it, which is good, and the actors seem to have retained their old chemistry. 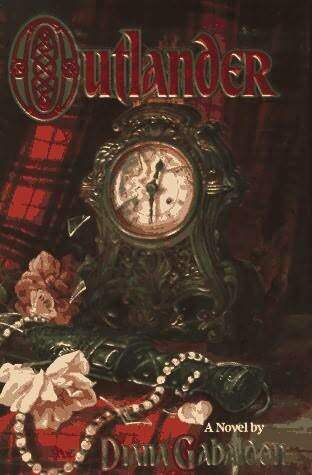 Sony Pictures TV are working on an adaptation of Diana Gabaldon's Outlander series of novels. The books feature a young woman who is periodically shifted in time from 1945 to 1743 and back again, becoming embroiled in a time-spanning love triangle as well as the major historical events of each period. There are currently seven novels in the series, having collectively sold more than 20 million copies over the last twenty-one years. An eighth novel will be published in 2013. Ronald D. Moore, best-known for his work on the new Battlestar Galactica (and, before that, Carnivale, Star Trek: The Next Generation and Deep Space Nine), is working on the script for the project right now. The project is still in the early planning stages and no casting announcements are expected for some time. Ron Perlman has - briefly - returned in the role of Hellboy. 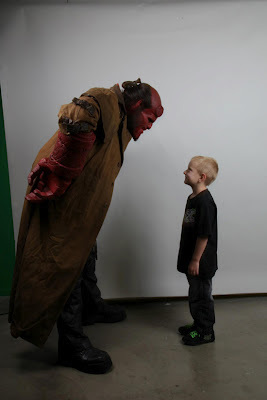 Perlman was recruited by the Make-a-Wish Foundation to suit up and meet Zachary, a young boy suffering from leukemia. Not only did Perlman make a fan's wish come true, it seems the experience has gotten him fired up about playing the role again. At Comic-Con, director Guillermo del Toro confirmed that he and Perlman have now decided to push for a Hellboy III to conclude the story begun in the first two movies. * Note: not actually official. Via Risingshadow, the cover art and blurb for Guy Gavriel Kay's River of Stars, his sort-of successor to 2010's excellent Under Heaven. Ren Daiyan was still just a boy when he took the lives of seven men while guarding an imperial magistrate of Kitai. That moment on a lonely road changed his life — in entirely unexpected ways, sending him into the forests of Kitai among the outlaws. From there he emerges years later — and his life changes again, dramatically, as he circles towards the court and emperor, while war approaches Kitai from the north. Lin Shan is the daughter of a scholar, his beloved only child. Educated by him in ways young women never are, gifted as a songwriter and calligrapher, she finds herself living a life suspended between two worlds. 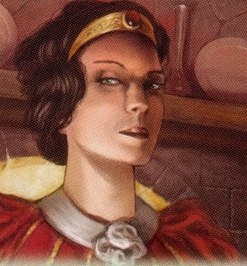 Her intelligence captivates an emperor — and alienates women at the court. But when her father’s life is endangered by the savage politics of the day, Shan must act in ways no woman ever has. 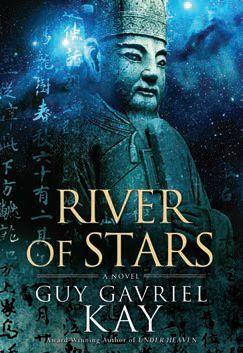 River of Stars will be published in April 2013. Disappointing, and a bit of a missed opportunity, it has to be said. 2044. The climate is wrecked, oil resources have been depleted and the world economy has still not fully recovered from the excesses of the turn of the century. Wade Watts, like millions of other teenagers, escapes the real world by playing in the OASIS, a computer programme that has combined the old Internet and numerous MMORPGs into a virtual reality existence. Five years ago the founder of the OASIS died, leaving his multi-billion-dollar fortune to whoever can solve an elaborate puzzle he left behind in the game. Millions have tried and failed...until Wade stumbles across a key clue. Suddenly a race is on: Wade and several fellow gamers competing with one another and a sinister corporation to be the first to win the prize. 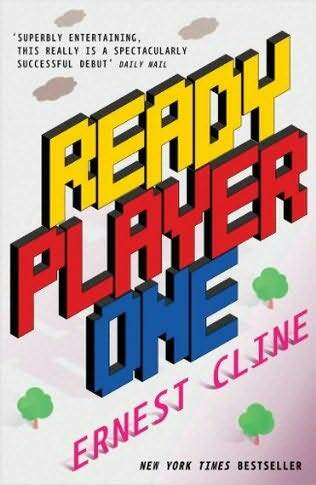 Ready Player One is the debut novel by writer Ernest Cline, whose previous genre credit of note was co-writing the 2009 movie Fanboys. Ready Player One, like that movie, is a geek-centric, nostalgia-heavy paean for the past. In this case, Cline references early video games, 'classic' movies of the 1980s and various TV shows and bands as he creates a cultural landscape which Wade must delve into to solve the puzzles left for him and millions of fellow gamers. The book is mostly set within the OASIS, with the world outside described fairly perfunctorily. There are allusions to ecological catastrophe, peak oil, climate change and the breakdown of society, but these elements are not developed very far at all. 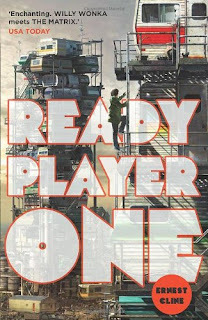 Within the OASIS things are more engaging, with Cline creating worlds dedicated entirely to 1980s video games or to fantastical environments where the rules of nature are twisted. It's basically Second Life meets Tad Williams's Otherworld with a dash of EVE Online and World of WarCraft on top and is described vividly and energetically. However, the creations are usually built on cultural references with Cline contributing little that is original. This is Ready Player One's key weakness. The book is a nostalgia-fest, a romp through 1980s video arcades, ancient home consoles, old-skool Dungeons and Dragons campaigns and repeated viewings of movies like Ladyhawke and WarGames. For those who get the references, it's great fun. For those who don't, the book struggles a little. Being born seven years after Cline (and the creator of the OASIS in the book), I got a lot of the references but others, particularly to the very earliest days of home gaming, were unfamiliar. Cline, to his credit, does try to explain each reference in as concise a manner as possible, but this has a tendency to slow down the narrative whilst not necessarily helping very much (my visual imagining of Joust was very different to the reality of the game when I finally looked it up online). The characters are straightforward archetypes, veering very little away from the standard. Main character Wade is an awkward, non-confident nerd living with an unsympathetic extended family and being irrationally blamed for their misfortunes (when we get a glimpse of Wade's home life I was half-expecting him to be sleeping a small cupboard, Potter-style). Cline shows a rare burst of imagination in suggesting that in the future, trailer parks will be overcrowded to the point of having trailers stacked on top of one another with supporting framework and these will sometimes collapse, to no-one's particular interest. The other characters are likewise standard: Art3mis is the cute-but-determined geek girl, Aech is the loyal best friend and two supporting Japanese characters are awesome with swords and much-concerned with honour, which is an unfortunate stereotype. There are a few surprises given that we only know these characters through their online avatars and their 'true' selves turn out to be rather different, but again there are few real surprises here. The villains are, well, snarling caricatures of evil whose motivations are unconvincing and whose chief representative, Sorrento, is a laughable cartoon character at best. So, we have a book which contributes little of its own to the genre, competently-executed protagonists and awful antagonists. Normally this would be enough to consign a book to the mediocre pile, but Ready Player One still manages to rise above this. Cline's narrative has pace, verve and energy. His ideas are standard but they are handled well, and some of Wade's less laudable activities raise issues about how healthy it is to live your life online or in computer games. Cline is celebrating nostalgia but certainly not advocating dedicating your life to it. The determination of some characters to 'change the world' with the prize money whilst others dream of building a spaceship and escaping also opens an interesting debate about maturity and dealing with consequences rather than running away from them. Plus, the book is so much damned fun. There's spaceship and mecha fights within the OASIS, antimatter bombings, a puzzle based around the D&D module Tomb of Horrors, a 3D recreation of Monty Python and the Holy Grail and laughs than you can shake a stick at. At one point, as he ascends the levels and achievements of the game, Wade chooses as his vehicle the DeLorean from Back to the Future with a Knight Rider-style front grill and Ghostbusters logos on the side. Whether you find that amusing, eye-rollingly inane or merely unimportant will determine how likely you are to enjoy the whole book, but certainly, as a child of the 1980s, I found it fairly entertaining. Ready Player One (***½) makes up for deficiencies in characterisation and originality with its fast-moving plot and engaging cultural references. The novel is available now in the UK and USA. A film version is in development. War has gripped the Seven Kingdoms of Westeros. As Robb Stark, the King in the North, leads his armies into the Lannister homelands, so Renly Baratheon leads a vast host out of the Reach, planning to take King's Landing and depose the boy-king Joffrey. A new player has also entered the game, with Renly's older brother Stannis claiming the Iron Throne and gathering allies to his banner. 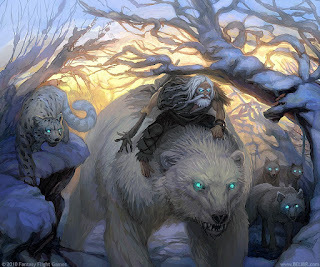 As the Seven Kingdoms slip into chaos, the Night's Watch mounts a large expedition into the lands north of the Wall, investigating reports of wildling forces gathering and White Walkers on the march. Thousands of miles to the east, Daenerys Targaryen and her newly-hatched dragons seek refuge in the fabled city of Qarth, but there finds betrayal and deceit waiting for her. The second season of Game of Thrones picks up where the first season ends and - somewhat loosely in places - follows the events of the second novel in the Song of Ice and Fire series, A Clash of Kings. For those who enjoyed the first season, it is possible to thoroughly (but not unreservedly) recommend the second. The standards of acting, set design and production values remain stunningly high. The original castmembers continue to do superlative work (it seems redundant to say it, but Peter Dinklage as Tyrion Lannister is fantastic throughout) and the new additions make an immediate impact. Most impressive is the addition of Stephen Dillane as Stannis Baratheon. If George R.R. Martin wrote A Song of Ice and Fire to be unfilmable, he wrote Stannis to be uncastable: an uninspiring martinet who nevertheless commands loyalty. Dillane knocks a tricky role out of the park and nails the character from the novels brilliantly. 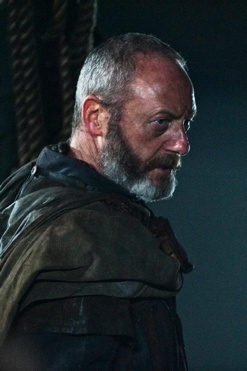 Most of the other new castmembers are also impressive: Liam Cunningham makes for a likable Davos Seaworth, Natalie Dormer brings her Tudors-honed skills of political conniving to the role of Margaery Tyrell and Oona Chaplin makes a good fist of a somewhat cliched character with Talisa (more on her later). Even the minor roles are compelling: Tom Wlaschiha's Jaqen H'ghar, Patrick Malahide's Balon Greyjoy, Michael McElhatton's Roose Bolton and Simon Armstrong's Qhorin Halfhand are all superbly-played, with the actors getting across their characters' personalities in just a handful of scenes apiece. Production wise, the show has stepped up in the second season. CGI is more plentiful and more artfully employed, with some excellent establishing shots (one of Harrenhal towards the end of the season is particularly evocative) and some great shots of the direwolves (now real wolves matted into the shots and enhanced) and dragons. That said, the show continues to be inexplicably reluctant to have shots of marching armies, continuing the first season's fine tradition of showing us twenty extras and claiming there's another 99,980 blokes just standing out of shot, which is more than a bit unconvincing. The second season does have some issues, however. The pacing and tightness of the story feels off compared to the first season. Some of this is because of the source material: A Clash of Kings is less well-structured and focused than A Game of Thrones. However, the TV series does increase these problems beyond those of the book. In the novel the absence of Eddard Stark as a central protagonist is somewhat alleviated by Tyrion Lannister taking on this role. Whilst Tyrion does step up to the plate in the second season, a lot of his scenes and subplots (such as the infamous chain sequence and the build-up to it) have been eliminated, reducing his role considerably. Whilst understandable from a production standpoint, it does make the second season feel a bit more aimless and disjointed than the first. A core criticism from some quarters revolves around the second season's faithfulness to the book. In fact, some of the changes for the second season were necessary. The chain storyline would have added layers of complexity, time and expense to the Battle of the Blackwater that were best avoided, painful as it was to lose them. The much-criticised relationship between Robb and Talisa is actually a change for the better, in my view (note: I appear to be the only person on Earth to think this). 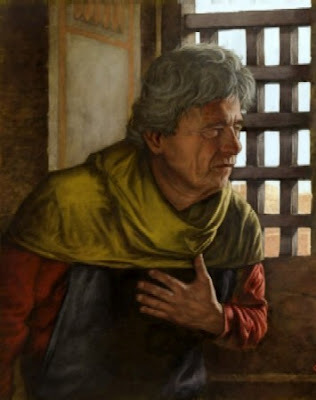 Having Robb disappear for a whole season and reappear with a new wife out of nowhere would have been nonsensical (the sort of thing you can do in a book but not in a visual medium) and following Robb's off-page story on the screen would have been fairly dull, forcing him to spend most of the season parked at one castle. The changes mean we get to know and (hopefully) feel some sympathy for Talisa rather than wondering what the heck was going on and why did Robb make such a silly decision. Other changes also work. Keeping Tywin at Harrenhal for most of the season simplifies the tactical movement of the war (again, something you can do in the book with a map to hand which is harder to get across on TV) and allows for some excellent scenes between Charles Dance and Maisie Williams's Arya Stark. There's an interesting feeling of amiable menace in these scenes. Unfortunately, the writers over-use the idea a little with too many scenes saying the same thing, and under-play the idea of Arya reminding Tywin of a young Cersei, which could have been milked further (this idea should horrify Arya, but she doesn't really react to it). Other changes are much less successful. Having cast the excellent Simon Armstrong as Qhorin Halfhand, it's then a monumental waste to change the climax of his story in the novels (an iconic moment which ranks amongst many readers' favourite scenes of the entire series) to something more confusing and less well-motivated. Non-readers will find the scene a bit off, but for readers the knowledge it could have been far superior by simply sticking to the page is extremely frustrating, especially as what we get instead (Jon Snow running around in some snow for two whole episodes in a row) is so inane. The same is true of Daenerys's storyline, which is even more inexplicable. 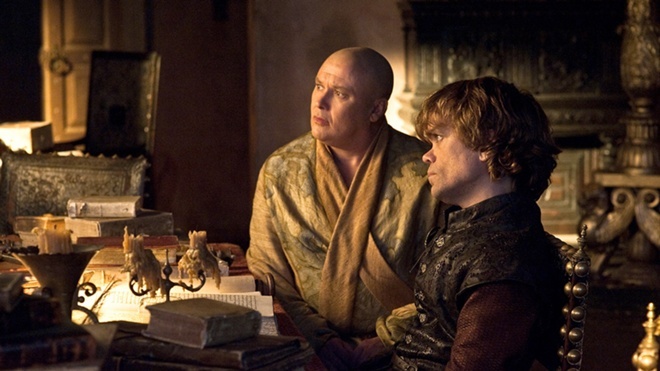 The decision to bulk out the Qarth storyline with the addition of a political thriller storyline is actually a good one, but is completely wasted because between the 'twist' (Dany's dragons being kidnapped) and its resolution (in the House of the Undying) we only get a couple of scenes of Dany looking worried and talking with Jorah Mormont. It would have been better to have cut out the interminable Red Waste scenes at the start of the season, gotten her to Qarth faster and given this storyline more depth. 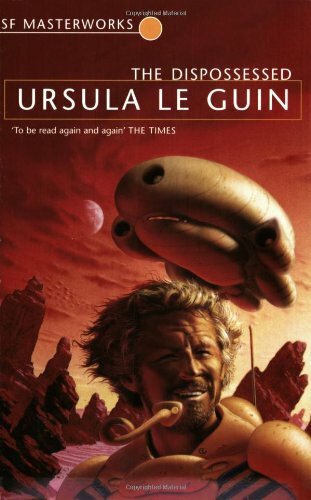 Instead, what we get is notably inferior to the novel (alleviated by some excellent visual imagery in the changed House of the Undying sequence) which, given this storyline's slightness in the book, is an impressive achievement. The season overall, is less compelling than the first. The storyline is more fragmented and, in some cases, the changes from the TV series result in scenes far less powerful and impressive than what is in the novel. 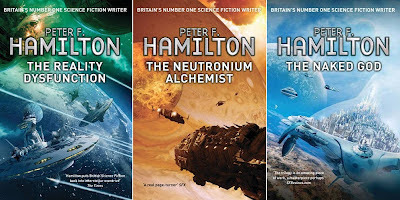 I am certainly not a book purist and welcome changes which improve the telling of the story in a dramatic medium, but in many cases the TV series adopts a course which is less interesting, less impressive and less resonant than the books. However, it is notable that the most successful storylines this season - Theon's, Tyrion's and the beginnings of the Brienne/Jaime relationship - are the ones that hew closest to the novels. The season does make amends for its many faults with the ninth episode, Blackwater. For the second season in a row it's George R.R. Martin's episode which is the stand-out of the season, an epic battle sequence lasting almost the whole episode but also featuring some sublime character development alongside the arrows and wildfire explosions (Cersei, Sansa and the Hound getting more development in this one episode alone than the previous eighteen episodes of the series combined). Absolutely brilliant stuff that restores the faith that, when it pulls itself together, Game of Thrones can stand alongside HBO's best dramas in quality. It just needs to do so more consistently. The second season of Game of Thrones (overall: ***½) has finished airing but should be available on DVD in February or March of 2013. Season 3 will commence airing on 31 March 2013. Shevek is a brilliant physicist from the barren anarchist world of Anarres. His work could revolutionise interstellar society, permitting instantaneous communication - maybe even instantaneous travel - between the worlds of humanity. But, in contrast to the idealism of Anarres, he finds his work undervalued and even repressed by jealous colleagues. Frustrated, he travels to Anarres's capitalist sister world of Urras, hoping to find more tolerance there but instead becoming embroiled in politics, rebellion and war. 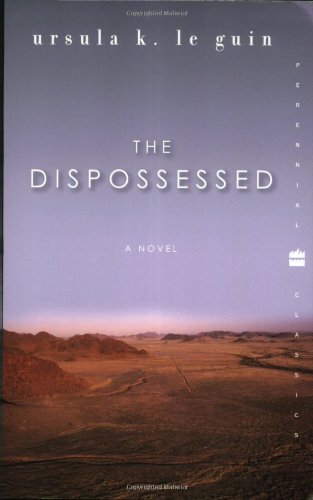 The Dispossessed is widely considered to be one of Ursula Le Guin's finest novels and is arguably her most ambitious work. The book asks nothing less than how best should human society function and by what means. Le Guin picks two popular models, that of a semi-communist state and a capitalist one, and pits them against one another. She is not interested in 'proving' the values of one over the other, instead comparing and contrasting the strengths and weaknesses of both and also the affect they have on the individual, particularly on the individual who has a great, transformational idea but whom is seen by others purely as a pawn or something to be crushed. The novel relies on this thematic idea to sustain it, but the actual plot structure is also intriguing. The book alternates chapters between the present-day storyline (Shevek on Urras) and events in his past (Shevek growing up on Anarres). We see the present-day Shevek as being an open-minded, questioning individual and how he has changed from his earlier incarnation as a blinkered man who accepts dogmatic ideas as fact (such as the notion that Urras is a corrupt capitalist state that will one day destroy itself), with later Anarres chapter depicting his shift in belief and motivation. Le Guin constantly has Shevek developing as a character even as she develops her ideas and the setting of the two worlds. The novel's greatest strength is its depiction of someone who seeks simple answers and is instead rewarded with having his worldview broadened and made more complicated. Shevek sees Urras as the answer to all his problems but instead of the utopia he was hoping for he finds a cluster of nations all feuding with one another (at one point fighting a Vietnam-style proxy war between two superpowers with the rulers acknowledging that nothing will change, only thousands dying for no real goal). Anarres is not rose-painted either: the world is desolate, the people poor and, for all of their freedom of choice, are often forced into jobs and roles they despise and are not well suited-for. The book is sometimes criticised for condemning capitalism and promoting communism/anarchism, but it's more complex than that. Le Guin's argument appears to be that all human societies are prone to dysfunction and corruption, no matter how well-meaning people are. The novel's ending is intriguing, as Shevek's conflicted views are commented upon by an outsider (an ambassador from an Earth ruined by war and ecological disaster) and her analysis spurs him to reconsider his approach. However, the book somewhat abruptly ends before Shevek's return to Anarres with him not having reached a conclusion. This is presumably because any answer would be unsatisfying and simplistic. Instead we are left with the questions, which are far more interesting. 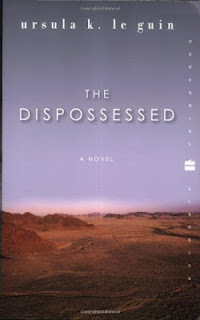 The Dispossessed (*****) is a thought-provoking novel that does not attempt to simplify complex matters and combines fascinating worldbuilding and character development with a refreshing plot structure and some rich prose. The novel is available now in the UK and USA. A trailer for the upcoming Judge Dredd film, Dredd, has been released. The film sees Judge Dredd taking on rookie Judge Anderson for training, only for both to become trapped in a 200-floor vertical slum ruled by a ruthless drug lord. The setting is Mega-City One, a vast megalopolis of 800 million people stretching down North America's eastern seaboard. 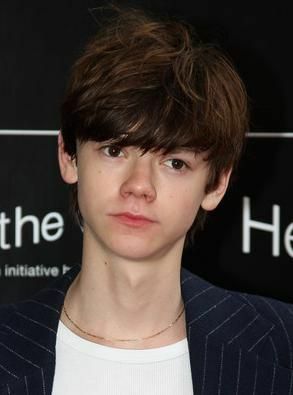 The film is set for release in the UK on 7 September 2012 and in the USA on 21 September. Karl Urban stars as Judge Dredd and Olivia Thirlby as Psi-Division Judge Anderson, with Lena Headey as the main villain, Madeline Madrigal (aka 'Ma-Ma'). The film was shot in South Africa with a budget of $45 million. It'll be in 3D (grumble) and has been R-rated in the United States. First impressions: looks reasonable (backed up by some solid early reviews). Thirlby, Urban and Headey all look good, the costumes and sets look decent and the whole thing certainly looks more promising than the disappointing 1995 Stallone movie. However, the depiction of Mega-City One looks dull. The Stallone movie did have an impactful visual style that worked very well. This version looks fairly generic in comparison. Before anyone asks, yes, Dredd keeps his helmet on for the duration. Orell is a wildling raider who possesses unusual abilities. He is a close advisor to Mance Rayder, the King-beyond-the-Wall. In the novels, Orell only has a minor role at the end of A Clash of Kings, where he is killed in a struggle with Jon Snow. 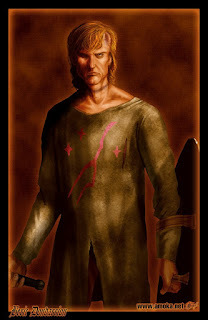 Orell's casting and other tidbits suggest that Orell's role has been combined with that of Varamyr Sixskins. Why he is called Orell and not Varamyr, given the latter's far greater prominence (he is even, briefly, a POV character), is unclear. Orell is being played by Mackenzie Crook. Crook is a familiar face from television and film. On TV he is best-known for playing the pedantic, military-obsessed Gareth in the original UK version of The Office. He also played Ragetti (the pirate with the wooden eye) in all three Pirates of the Caribbean movies. Thoros of Myr is a red priest, a follower of the Lord of Light like Melisandre. Unlike Melisandre, Thoros is a drunkard and a warrior, more at home on the battlefield with his flaming sword (a normal sword covered in wildfire) than praying. He is a former friend and drinking companion of King Robert Baratheon. 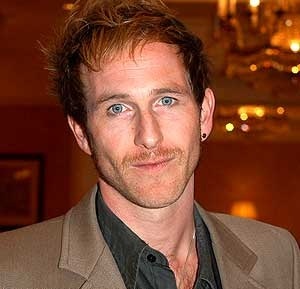 Thoros will be played by Paul Kaye. Kaye is a well-known British comedian who debuted in the 1990s, most notably for his role as shock-interviewer 'Dennis Pennis'. In the early 2000s he moved into serious acting and has appeared on British dramas including Waking the Dead and Hustle. Edmure Tully is the younger brother of Catelyn and Lysa Tully, and the eldest son and heir of the ailing Lord Hoster Tully of Riverrun. 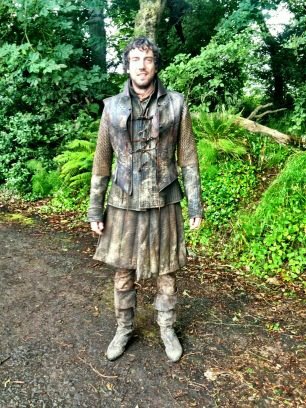 Though brave, Edmure is also untested on the battlefield and lacks the fine political judgement of his elder sister Catelyn. 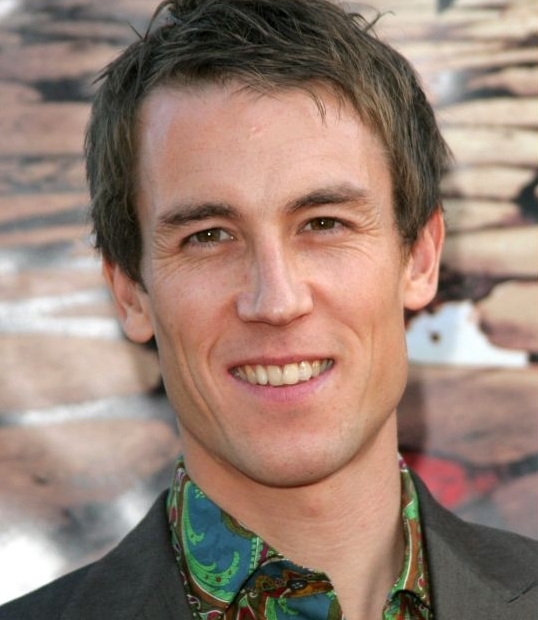 Edmure will be played by Tobias Menzies. 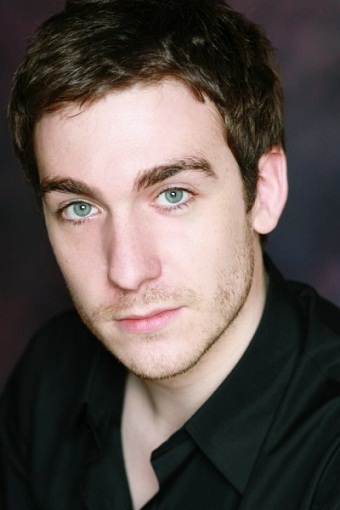 Menzies is best-known for playing Brutus on the HBO series Rome, and more recently has starred in the British spy drama Spooks. Brynden 'the Blackfish' Tully is the younger brother of Lord Hoster Tully and the uncle of Catelyn, Lysa and Edmure Tully. An experienced soldier, knight and warrior, he is noted for his strategic skills and obstinate nature. As previously indicated, Brynden will be played by Clive Russell, an experienced British actor. I'd suggest checking out his performance as Mr. Vandemar in Neil Gaiman's TV mini-series Neverwhere, where he is superb. Selyse Baratheon, formerly of House Florent, is the wife of King Stannis Baratheon. 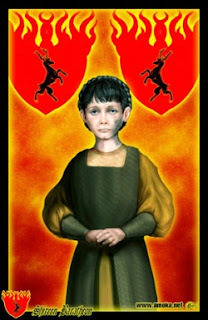 Her health has not been good ever since the devastating Siege of Storm's End during Robert's Rebellion, and she spends most of her time restricted to a tower at Dragonstone (note: info from Season 2 of the HBO series, in the novels she is somewhat more mobile). 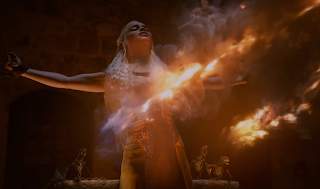 She is an ardent worshipper of the Lord of Light and follows Melisandre's every word of advice. Also as previously hinted, Selyse will be played by British actress Tara Fitzgerald, whose list of roles is far too large to mention here. Tormund Giantsbane is one of the wildlings' chieftains and battle commanders. A hugely gregarious, outgoing man with a tremendous sense of humour, he also has a rough sense of honour and conscience. He is one of Mance Rayder's closest allies. 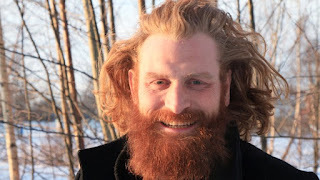 Tormund is played by Norwegian actor Kristofer Hivju. Hivju most recently appeared in the prequel to The Thing and is working on the new M. Night Shyamalan movie, After Earth. 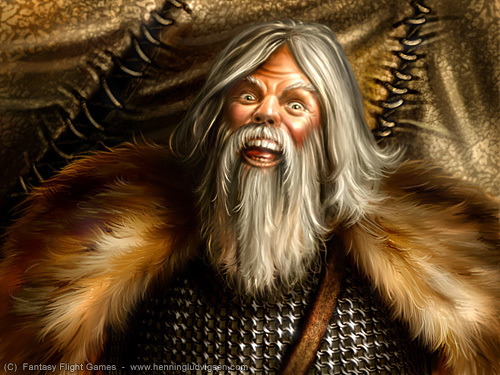 Lord Beric Dondarrion is the Lord of Blackhaven, a small castle in the Dornish Marches. Beric has already appeared in Game of Thrones, when he was dispatched by Eddard Stark in Season 1 to apprehend Gregor Clegane just before the outbreak of the War of the Five Kings. 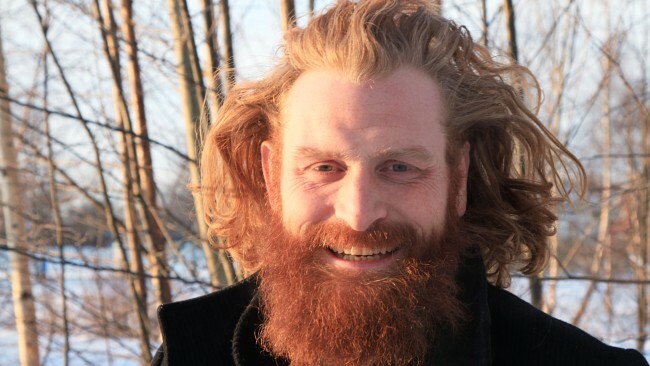 For whatever reason, HBO has decided to recast the role of Beric. 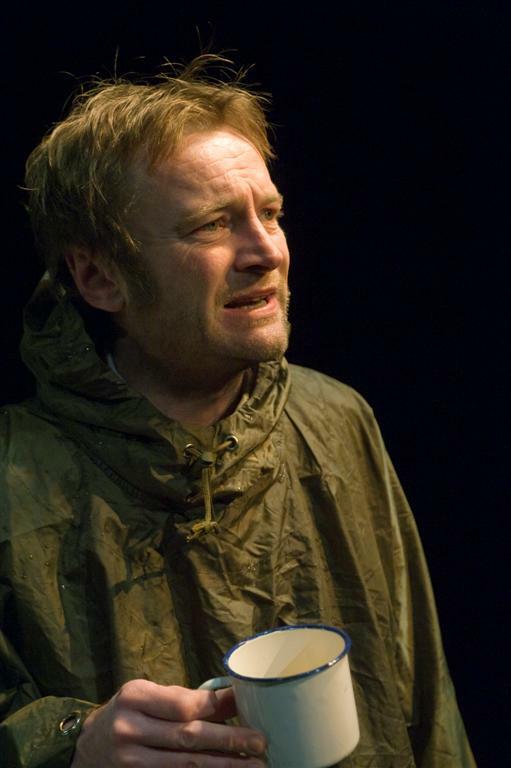 He will now be played by Northern Irish playwright and actor Richard Dormer. 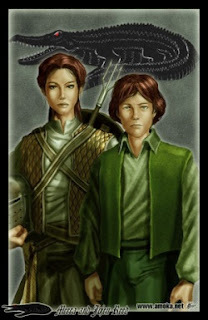 Jojen and Meera Reed are the children of Lord Howland Reed of Greywater Watch, one of Eddard Stark's closest friends and allies. 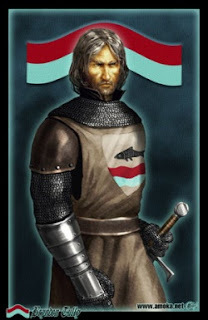 The Reeds guard the Neck against enemies encroaching from the south, and have a hostile relationship with House Frey. The Reeds appear in the second novel, but were delayed until the third season due to cost reasons. Playing Jojen is Thomas Brodie Sangster, unfortunately doomed to be known as 'that kid from Love, Actually' for life. He also starred in the Roman historical movie The Last Legion. Playing Meera is Ellie Kendrick, best-known for playing the title role in the 2009 BBC mini-series The Diary of Ann Frank. She has more recently appeared in Upstairs Downstairs. 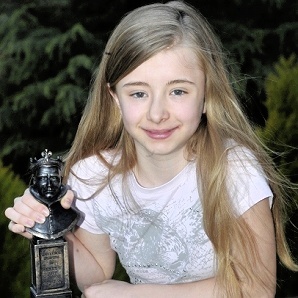 Shireen will be played by Kerryn Ingram, who recently won a Laurence Olivier Award for her appearance in the musical Matilda. 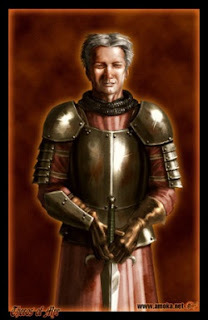 Qyburn is a former maester of the Citadel who was invited to leave after performing some rather bizarre medical experiments on corpses. Qyburn has since made his living offering his knowledge and skills to whoever needs them, and in the War of the Five Kings some interesting opportunities have arisen for him to ply his trade. 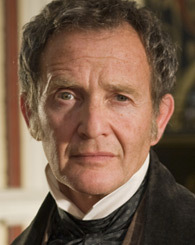 Qyburn will be played by British actor Anton Lesser. Enormously experienced on stage, screen and radio, he recently appeared in the one-off drama The Man Who Crossed Hitler, the fourth Pirates of the Carribean film and was a recurring character on Primeval. On radio he is best-known for playing Lindsey Davis's signature character of Roman investigator Falco, in adaptations of five of her novels. 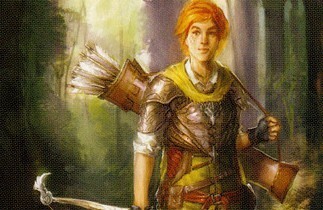 Anguy is a noted archer and marksman who frequently wins archery contests at tournaments. 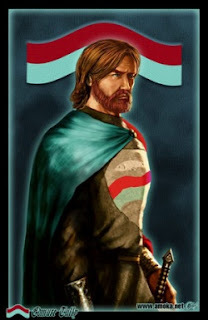 In the Song of Ice and Fire novels he won the archery contest at the tournament in honour of Eddard Stark and afterwards joined Beric Dondarrion's mission into the Riverlands. It is unclear if this will be the same in the TV series. Anguy is played by Philip McGinley, a British actor best-known for his recurring role on Coronation Street as Tom Kerrigan. Missandei is a young woman from the island of Naath, enslaved by pirates and sold in the flesh-markets of Slaver's Bay. She currently serves Kraznys, a slave-trader in the city of Astapor, as a translator. Missandei is played by Nathalie Emmanuel, who recently left a long-running stint on the soap opera Hollyoaks. Roles still to be announced: Mance Rayder, Daario Naharis, (presumably) Kraznys, Hoster Tully and possibly a few more. At this time I think it's likely that Oberyn Martell has been delayed until Season 4.